He finally met Naropa, adorned with six ornaments of bone, on the summit of a cliff. Having searched for Naropa for so long, filled with joy at finding him, he climbed up and embraced him immediately. Naropa was delighted to see Marpa, and told him, "I am now going to reveal a teaching that is unknown in the Land of Snows, Tibet. You are the one chosen to take this precious teaching to there." Upon hearing that, Marpa offered all the gold that he had brought with him to Naropa. Although Naropa said that he had no real use for gold any more, Marpa still insisted that he should have it, on behalf of the Tibetan people, in return for the valuable teaching that he was going to give to Tibet. Taking all the gold dust in his hands, Naropa threw it in the air, in the forest, and it fell everywhere on the ground. As Naropa threw the gold and it scattered, Marpa felt a little regret about this action, probably because he had had so much hardship in gathering and bringing such a valuable qauntity of gold. Naropa seemed to be reading his mind. With a smile on his face, he opened his palms and all the gold dust that he had thrown in the air was now again in his hands. Not only that, but Naropa pointed his finger, and at that very moment, the ground where they were sitting was transformed into solid gold. Having done that, Naropa said to Marpa, "Now you must be hungry. Let's eat something." And so saying, Naropa gazed up in the sky. At that moment, from the sky fell a huge fish, whose body was filled inside with tsok (feast offerings). Naropa told Marpa it came from the heavenly realm where Tilopa resided, and it came as a heavenly gift, a blessing from Tilopa. So they enjoyed the feast of tsok, and as they did, Marpa's inner strength, wisdom, and realization matured, simply by enjoying the offering from Tilopa from the heavenly realms. Having taken and enjoyed this blessing, Marpa experienced a significant renewal of his vital energies. He became stronger and more youthful, physically obtaining all his old strengths back, and he was no longer feeling the weakness of his old age. Naropa then asked Marpa to purify himself further by taking a bath in the small river that was nearby. Marpa went there to bathe. He took off all his clothes, including a very precious mandala protection (yantra) that he wore around his neck as a blessing. He left it on top of his clothes, and went into the river to bathe. At that moment, a black crow swooped from the sky, took his mandala blessing into its beak and flew away with it. Naropa, seeing that Marpa's blessing was being taken away by a black crow, pointed his finger at the bird. Both the crow and the blessing fell to the ground. This was a symbolic omen that Marpa was going to experience some negative obstacles and hindrances, not only for himself but also for the lineage of transmission, the mahamudra. It foretold that this transmission would experience some unfavorable circumstances. Naropa promised Marpa that these obstacles he would experience would be eliminated through his special blessing, which he gave Marpa. 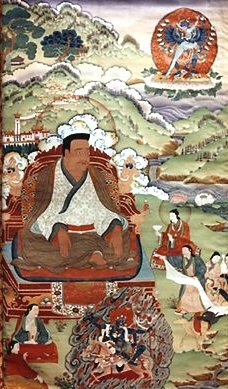 With that promise, Marpa's guru once again gave him all the empowerments that he had already given him before, to refresh the memories of his teachings. In addition to that, he gave a very profound teaching that he had never revealed to anyone before: the Six Yogas of Naropa.